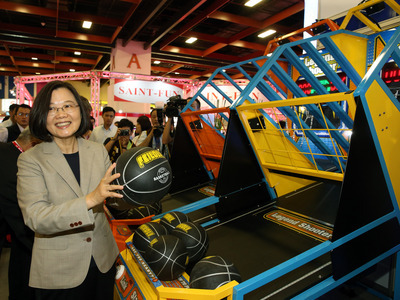 Taipei, March 22 (CNA) The ruling Democratic Progressive Party (DPP) is set to begin procedures to nominate its candidate for president, while the opposition Kuomintang (KMT) continued to struggle to settle on a way to choose its presidential nominee. President Tsai Ing-wen (蔡英文), who has fared poorly in recent opinion polls when matched against potential 2020 election opponents, is being challenged for the DPP nomination by former Premier Lai Ching-te (賴清德). The DPP, which hopes to nominate its presidential candidate by sometime in April, said it will first try to talk the two candidates into forming a ticket together for the 2020 race or having Tsai or Lai drop their candidacies. Those efforts are set to last from March 23 to April 2, though that time frame could be extended because Tsai is currently visiting three of Taiwan's Pacific allies and will not return home until March 28, the party said. If coordination efforts fail, the DPP said it will elect its candidate through a set of public opinion polls conducted by five selected polling companies. Meanwhile, KMT spokesman Ou-Yang Long (歐陽龍) said the party will select its presidential candidate at its national congress sometime in late July or early August. Asked if waiting so long to come up with a nominee would put the KMT at a disadvantage, Ou-Yang said he did not expect it to be a problem because it will allow his party to eventually field its "strongest candidate" in the election. Several KMT members, including former New Taipei Mayor Eric Chu (朱立倫), former Taipei County Magistrate Chou Hsi-wei (周錫瑋) and former Legislative Yuan Speaker Wang Jin-pyng (王金平), have declared their intention to compete for the KMT nomination 2020. Many party members, however, are strongly urging the party to call on popular Kaohsiung Mayor Han Kuo-yu (韓國瑜) of the KMT to run for president. Han has repeatedly scored the highest in opinion polls of any KMT hopefuls, but he only starting serving his first term as Kaohsiung mayor on Dec. 25, 2018, and it might hurt him to seek a national post less than a year after his surprising win in Kaohsiung. The KMT has decided to retain its usual selection process for a presidential candidate, which consists of 70 percent public opinion polls and 30 percent party member opinion polls. Facing calls to enlist Han, KMT Chairman Wu Den-yih (吳敦義) has said the party will preserve the possibility of calling up Han even if it is at a mere one in 10,000. A proposal within the party, however, to replace the primary with a coordination mechanism so that Han could be considered for the nomination even if he does not declare his bid to run has failed to acquire the approval of presidential hopefuls Chu and Wang.